There is a growing requirement for researchers to write and maintain software, but they receive little training in software development. 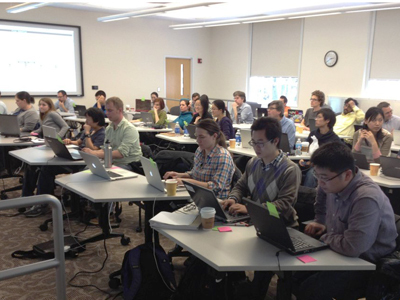 The Software Sustainability Institute offers training to help researchers develop their software development skills. We support a range of activities from running workshops to advising on training curricula for computational skills. Our training events can be co-located with conferences and workshops as well as being organised for specific initiatives, collaborations or projects. Aleksandra Nenadic is the training team lead. For more information about training, please email us. Software Carpentry and Data Carpentry initiatives teach researchers software development and data handling skills to help them be more productive and make their research robust and reproducible. Each workshop is a highly-interactive two-day training event which gives researchers an opportunity to gain in essential skills for their research. We provide advice on the organisation and running of workshops and can help recruit instructors and helpers from Software and Data Carpentry's pool of volunteers. For more details on our collaboration see our Software Carpentry and Data Carpentry pages. The Software Sustainability Institute is an EPSRC-approved supplier of training packages for the Centres for Doctoral Training (CDT). We deliver talks in best practice on research software development and sustainability, spanning our many areas of expertise. Our guided discussions bring together researchers, research software engineers and other experts to explore issues relating to research software development and sustainability.